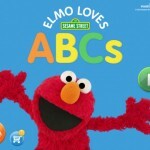 Sesame Street’s most lovable monster Elmo is back to share his passion for the English alphabet with your little one. 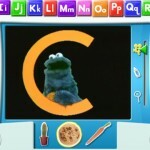 Elmo has a large fan base with an even wider age range, but this app requires some skills that come with age. Elmo has long been considered the jack-of-all-trades when it comes to teaching children about basic skills and milestones. He’s tackled reading, counting, and potty time, and now he’s back to teach you the alphabet, with the enthusiasm and high-pitched giggle that you’ve come to know and love. When I opened Elmo Loves ABC’s, I was met with Elmo’s signature enthusiasm as he told me that the fun will begin once I touch any one of the letters that framed the center of the screen in brightly colored boxes. 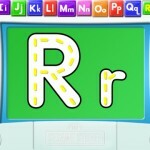 Displaying both upper- and lower-case versions, the letters then required tracing on dotted yellow lines in order to proceed. The tracing “unlocked” three realistic images that each begin with the respective letter. When I chose “P”, for example, an actual photographic image of a pencil, a pie, and a pig showed up. Each item had a corresponding video clip from an actual Sesame Street episode; I got to enjoy a friendly debate between Bert & Ernie about the size of pie slices. I also had the option to paint (with fingers or stylus) a coloring page that outline images that relate to the letter. A third game option within each letter is “hide-and-seek”, where I had to reveal each photographic image by either popping virtual bubbles or brushing away leaves. When I pushed the music note button in the lower right-hand corner of the screen, I was brought to one of five versions of the alphabet song, none of which sound like the tradtional tune that we are usually taught. 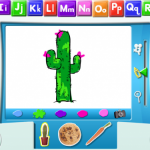 The music videos are fun and funny, which helps to encourage music appreciation and memory skills in children. In my opinion, though, the most impressive feature of this app was the option for parents to create an account to track their child’s progress within the app. This makes me feel good as a parent – I know that I could see concrete proof of my child’s educational development, even when I’m not there to watch his every swipe and touch. Equally as cool was the fact that I could customize each letter by uploading a picture, video, or sound clip. I promptly snapped a pic of our dog to go under the letter “D”, and my four-year-old was delighted when the pup’s face popped up. This is a very clever and easy way to help reinforce the letter-learning skills by using objects that appear in a child’s every day routine. This app may be on the expensive end when it comes to children’s programs, but the extra customization and progress tracking really make it worth the download. While the official iTunes description claims that there are seasonal expansions available as in-app purchases or upgrades, I didn’t see any options for that within the app.